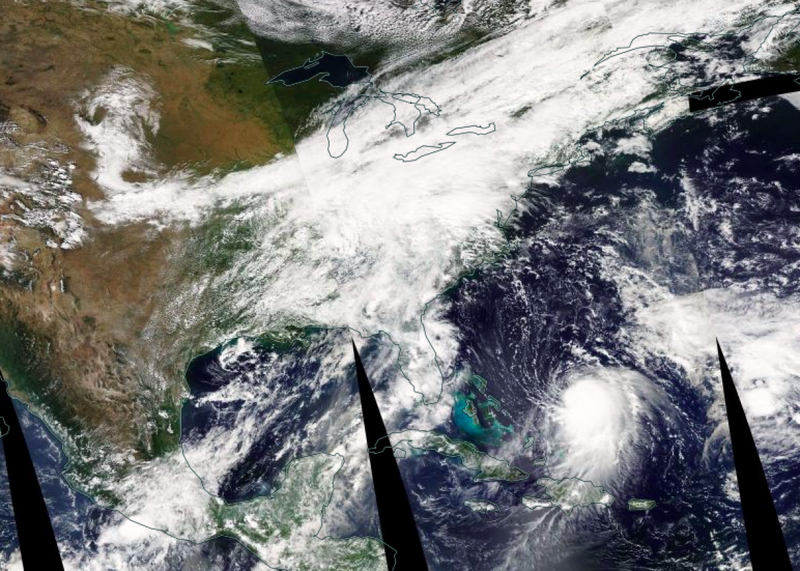 Hurricane Joaquin: Sandy-like possibilities and a scary forecast for Washington, D.C. Rain clouds shrouded the East Coast as Hurricane Joaquin loomed near the Bahamas on Wednesday morning. Update, 11:40 a.m.: The National Hurricane Center’s late morning update to Hurricane Joaquin’s forecast now has the storm aimed squarely at the East Coast, with the center just offshore the Delmarva Peninsula on Monday morning. It also includes a must-read “key messages” section that emphasizes the uncertainty in the current forecast: Basically, all options are still on the table, but the characteristically deliberate NHC seems increasingly on board with an East Coast landfall. Over the past 36 hours, a deeply troubling trend has emerged in this week’s weather forecast: In addition to the torrential rainfall currently impacting much of the East Coast, it’s looking increasingly likely that a major hurricane could also be headed toward land on Saturday or Sunday. A ghostly satellite image of intensifying Hurricane Joaquin early Wednesday. The area of most intense concern for Hurricane Joaquin is the mid-Atlantic, from North Carolina’s Outer Banks to New Jersey. The current worst-case scenario: Many weather models have been homing in on the possibility of a Hurricane Sandy–like hard left turn into North Carolina, Virginia, or the Delmarva Peninsula, which could produce enormous impact in Washington, D.C.—this is similar to the scenario mapped out in a 2007 Washingtonian article that imagined a Category 3 hurricane entering the Chesapeake Bay and flooding the National Mall with saltwater. While that disaster is unlikely to occur with Joaquin, it’s worth considering, which feels shocking to say since this storm wasn’t even on many meteorologists’ radar two days ago. The most likely scenario at this point is an East Coast hurricane landfall, though it’s still too soon to say exactly where. There’s also still a slim—and narrowing—chance the storm could dawdle near the Bahamas long enough to be shunted safely out to sea. The NHC’s hedging is due almost entirely to one model—the European—which, while historically the most accurate when it comes to forecasting hurricanes, is also currently an outlier: It shows Joaquin being shunted out toward Bermuda after a close brush with the Bahamas. That doesn’t mean the European model is wrong, but it does mean significant weight should be given to the fact that virtually every other independent model shows a dangerous landfall somewhere on the East Coast. Only one of the 21 submodels in the Global Forecast System’s forecast shows Joaquin remaining safely out at sea. But what’s increasingly clear is the atmospheric and oceanic environments supporting Joaquin are becoming nearly ideal for rapid strengthening—very low wind shear is forecast, which should help create a symmetric and darkly beautiful major hurricane over the next two or three days fueled by very warm tropical waters near the Bahamas. In fact, water temperatures near Joaquin are currently at all-time record levels and could easily support a Category 5 if all other factors align. A foot of rain—or more—is possible across much of the East Coast this week as Hurricane Joaquin approaches. Some weather models, like the Hurricane Weather Research and Forecasting and the GFS—the two flagship models of the National Oceanic and Atmospheric Administration—have consistently showed that’s not such a far-fetched scenario. A high-end Category 3 or 4 is now likely for Joaquin at its peak, which would pack sustained winds of more than 120 mph and generate a large storm surge should Joaquin make landfall—and 50-foot waves even if it doesn’t. As it approaches the U.S. coastline, Joaquin is likely to weaken to around a Category 2. Even if Joaquin somehow avoids a U.S. landfall, it’s going to rain a lot in a lot of cities over the next few days. This morning’s GFS model shows a ridiculous 2 feet—or more—of rain possible over the Carolinas by Monday.